Fruit & Nut Bar Cookies - inspired by a favourite candy bar! Fruit & Nut Bar Cookies. Inspired by Cadbury’s Fruit and Nut candy bar, this recipe combines favourite dried fruits like cranberries or golden raisins with a double chocolate chip cookie. This Fruit & Nut Bar Cookies recipe was inspired by one of my favorite candy bars, Cadbury’s Fruit & Nut bar. 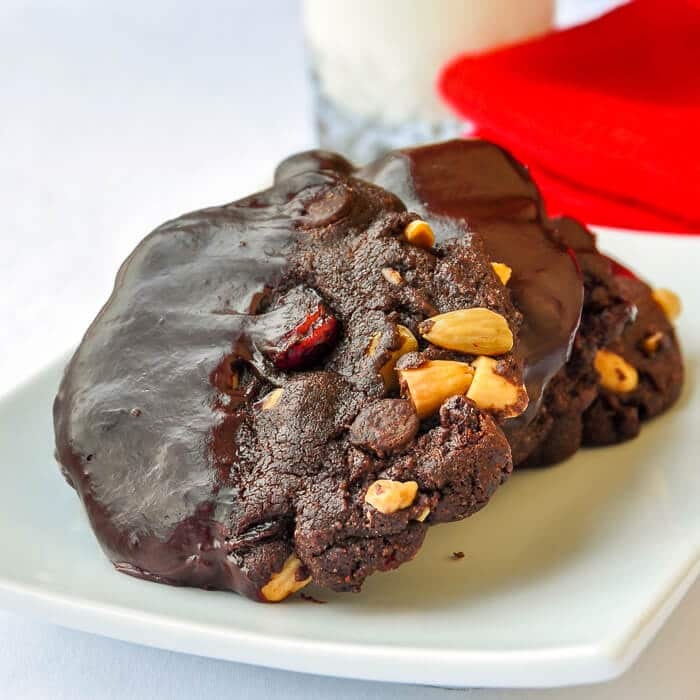 The combination of sweet raisins and crunchy toasted nuts in chocolate is irresistible to me and that combination works very well in these cookies. The fruit & nut bar cookies themselves remain soft with crispy edges with a fudgy interior and plenty of textural additions from the chewy dried fruits and crunchy toasted nuts. Several dried fruits will work in these, from golden raising, dried cranberries or even candied dried strawberries. I’ve used a combination of all three in this version and that combination was outstanding. 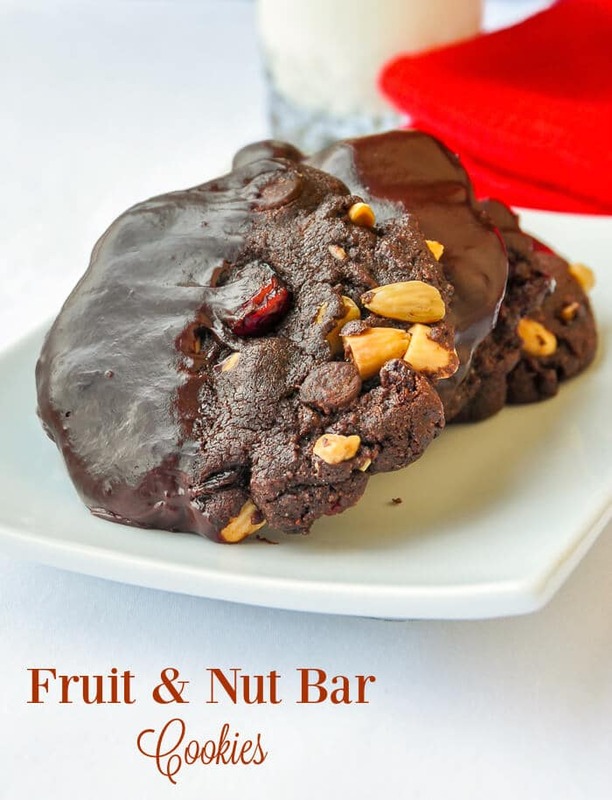 Like this Fruit & Nut Bar Cookies recipe? 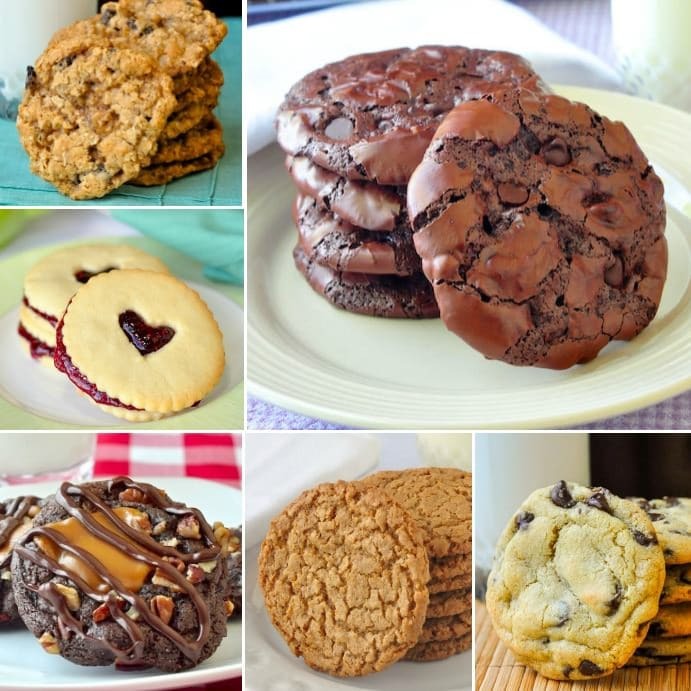 You’ll find over 200 recipes for cookies and cookie bars in our Cookies Category. If you like this recipe, be sure to check out out collection of Favourite After School Cookies! Fruit & Nut Bar Cookies - inspired by Cadbury's Fruit and Nut candy bar, this recipe combines favorite dried fruits like cranberries or golden raisins with a double chocolate chip cookie. Add the eggs and vanilla to the creamed mixture and beat until well combined. Sift together the cocoa, flour, baking soda, and salt. Add the dry ingredients to the creamed mixture. Mix well until a dough begins to form. Fold in the chocolate chips, chopped almonds and dried fruit. Wrap the dough in plastic wrap and refrigerate for several hours or overnight. Dough should be cold when it goes in the oven. Roll the dough into about 1 1/2 inch balls. Place about 3 inches apart on a parchment paper lined baking sheet and flatten the balls to about half their height with the bottom of a clean drinking glass. Bake at 375 degrees F for about 13-15 minutes. Allow the cookies to cool on the pan for several minutes before placing them on a wire rack to cool completely. let the dipped or drizzled cookies sit on a parchment lined baking sheet until the chocolate sets. Store in an airtight container. Freezes well too. To make Chocolate Ganache for drizzling or dipping just melt together the 1 cup of chocolate chips and 1/4 cup of whipping cream.